We’ve had a long love-affair with the incredible fabrics and clothes produced by the Italian design-house Missoni. In 2016 we were lucky enough to begin working with the company’s sub-brand Missoni Home. We love the crazy chevron or zigzag pattern the company is famous for. So it was no surprise that Missoni’s imaginative use of this ancient pattern works beautifully on furniture and home accessories. But a room full of zigzags may, some might say, be a little too much. It’s a bold design, as is anything geometric. Throw into the mix bright and clashing colours and if you’re not careful you’re creating a 70’s psychedelia throwback nightmare. With the current trend for dark walls and heritage colours (thanks Farrow & Ball) we’re constantly advised to use pops of colour to bring a room alive. Enter stage right: Missoni Home. And it’s not just brightly coloured zigzags. Add to the mix bold stripes and some near hallucinogenic florals and you have a smorgasbord of colour and pattern to pick and choose from. The Missoni Home Navaleno rug above demonstrates the Missoni chevron pattern at its best. Depending on which camp you’re in (‘throw caution to the wind, mix and match YOLO’,… or ‘love each piece individually but… together?’) this particular styling is either heaven or will make you want to lie down in a room with dark walls. Personally we love it! 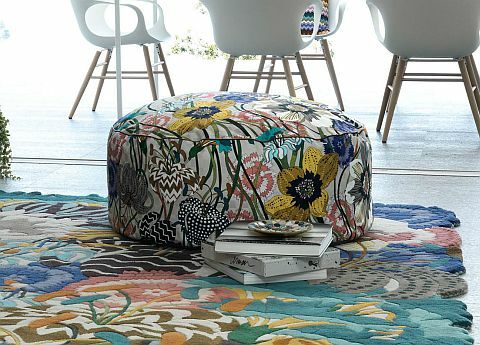 The stylist has placed the rug with a Missoni Home pouf which features the famous zigzags along with the company’s bold, beautiful florals. All of Missoni Home’s designs are manufactured in Italy and anyone who is lucky enough to own a piece of clothing, an accessory or furniture will know how high the quality is. The Navalino rug is a pure wool and cotton blend and incredibly soft but hard-wearing. The sheer number of colours used is awe inspiring. Not one of them, however, dominates the entire colour palette. Which in our book is very clever. We love poufs (or any piece of furniture that legitimately insists you put your feet up). You couldn’t really say no! Missoni has created some of the most comfortable and fun poufs we’ve come across. Each pouf is firm and filled with polystyrene beads that allow just the correct angle for lounging. And the fabric covers are fully removable. The Missoni Pallina pouf above is simply stunning. The fabric used here is called Passifora and it’s just one of so many beautiful floral fabrics on offer. Think passion flowers, sunflowers and lilies. It’s one of Missoni’s most famous floral designs, originally seen on the catwalk printed on their silk dresses, skirts and scarves. We have a huge choice of Missoni fabrics to chose from. So if there’s a particular colour scheme you have in mind, a favourite flower, or a mixture of the two, let us know. We’d put money on being able to come up with something to fall in love with. Pop into Go Modern’s Kings Road showroom to have a look at fabric samples or give us a ring to find out more. UK fire regulations are quite rightly very stringent, and some Missoni fabrics are not available here but are available overseas. Again, come in and chat to us, as there’s an an option to have some of the unavailable fabrics specially treated so that they do comply with UK fire law. However, it’s not just about the fabrics folks. 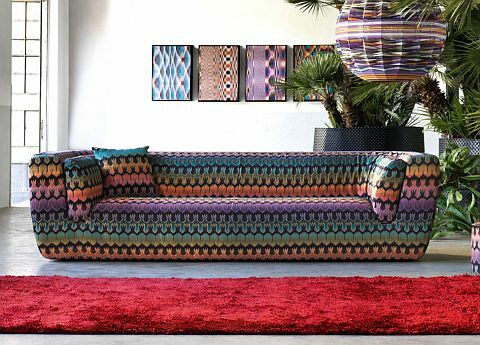 Home is one of the great passions of Rosita Missoni, the Missoni ‘matriarch’, who oversees the Missoni Home line. Born into a family of textile industrialists who produced shawls and embroidered fabrics, she married Ottavio Missoni in 1953 and together they launched and developed a knitwear business in a small workshop in Gallarate, Italy. The couple later moved to the company’s current headquarters in Sumirago, Varese, where Rosita created the lines of clothing while Ottavio designed the fabrics. By the 1960s, Missoni was at the cutting edge of Italian fashion. Rosita is quoted as saying, “… the house is alive, it always moves, it’s never over …”. 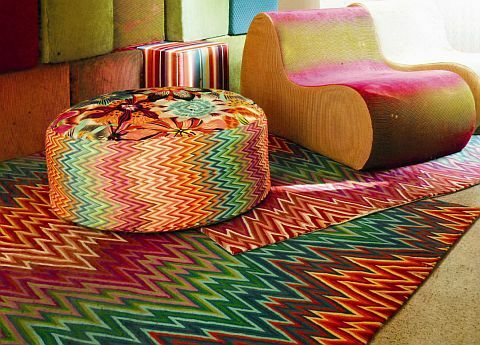 Her personal philosophy and design vision for furnishings is expressed through Missoni Home. Pieces are innovative with a linear form and easy to introduce into existing areas. Using Missoni’s fabrics the brand aims to play a game of indoors/outdoors bringing the ‘magical atmosphere’ of nature inside. The look is both ‘formal and informal’, ‘artful but light’, with ‘forms which separate and unite’. The overall philosophy: simply to create pieces that will help make ‘a versatile and welcoming place for family and friends’. The striking Innitil sofa above does just that. It’s a roomy three-seater with a linear back and armrest. The solid wood frame is covered in a multi-density, crush proof polyurethane foam and the covers are removable. The fabric used for the styling here is Pasadena, inspired by a Californian west coast vibe, using a hypnotic geometric jacquard pattern. Then just when you think your eyeballs wont take anymore colour, there’s the monochrome… and a brand new piece of design. The Miss dining chairs are beautifully upholstered, with slim legs, arms and backs, and a robust steel frame giving just the right strength and stability expected of a dining chair. The expanded polyurethane cushions have variable densities for maximum comfort, perfect for long, relaxed dinners. 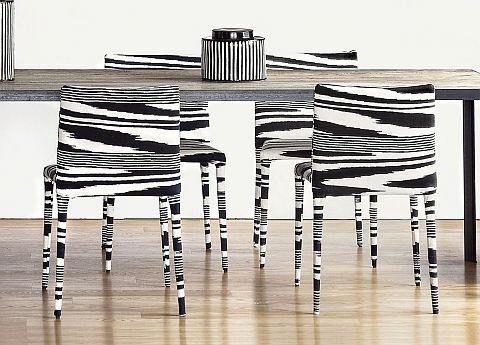 There’s a freshness about the design of these new chairs that we just love, and the black and white ‘zebra’ print fabric used here is Neuss linen with a macro-flame pattern. Simply stunning, like a huge photo blow up of the original zigzag pattern. The Miss range also has a dining armchair too – the same style but with wonderfully exaggerated vertical arms that look like wings, which look like they might just whisk you off after one glass of Chianti too many. And if Missoni plays the game of indoors/outdoors with their fabrics, their stunning outdoor furniture collection is a game we could play for ever. Lots to choose from including chaise longues, garden sofas, armchairs and this amazing leather coffee table that exudes Italian style. The elegant Cordula coffee table has an extra-clear glass table top and the solid steel frame below is wrapped in a beautiful leather weave. There’s also a matching armchair to complete the look. 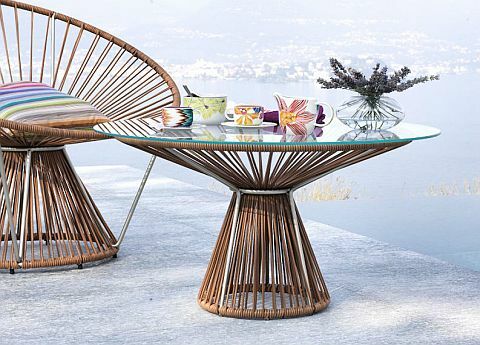 Beautiful design with Missoni’s usual attention to detail and innovative use of materials. So, as we always say, hop over to the Go Modern site and take a look at all of our great Missoni Home furniture designs and share our love of this wonderful Italian brand’s heritage and style.